On 6 November, ESA’s first British astronaut, Tim Peake, will be paying his last visit to the UK before his launch to the International Space Station. He will take part in a news conference at the Science Museum London to discuss his upcoming mission. Together with Jo Johnson, UK Minister of State for Universities and Science, Thomas Reiter, ESA’s Director of Human Spaceflight and Operations, and David Parker, CEO of the UK Space Agency, Tim will talk with journalists about his training, and the science and education objectives of his mission. While in space, Tim will perform more than 30 experiments for ESA and its Member States and take part in numerous others from ESA’s international partners. Tim’s mission is ESA’s eighth long-duration mission to the Space Station. It will start aboard a Soyuz spacecraft launched from the Baikonur Cosmodrome in Kazakhstan on 15 December. Together with NASA astronaut Tim Kopra and Russian cosmonaut Yuri Malenchenko, Tim will embark on a six-month stay in space. The mission is named Principia, after Isaac Newton’s ground-breakingNaturalis Principia Mathematica, which describes the principal laws of motion and gravity. ESA and the UK Space Agency are together developing many exciting educational activities aimed at sparking the interest of young children in science and space, including Rocket Science, AstroPi, Zero Robotics, Mission-X Train like an Astronaut, and amateur radio contacts in space. EXOMARS is an exciting mission that’s happening sooner than you think, with a launch window now in March 2016. The mission, which is a joint venture with ESA and Roscosmos (the Russian space agency) will not only result in a presence in orbit around Mars taking measurements of atmospheric gases (potentially linked to present-day biological activity) but will also test landing capability on the red planet in advance of a more sophisticated landing mission, Exomars 2018. The Schiaparelli module will separate from the orbiter and prove controlled landing technology to be used again with Exomars 2018. This mission will see the first European Rover on Mars, a robotic vehicle currently being tested at the Airbus facility near Stevenage in the UK. The analogue Martian surface is a large space at the Airbus Space centre near Stevenage, and it will continue use after the mission begins in order to be on hand to work out and resolve any challenges that may come toe rover’s way on Mars. The collaboration between ESA and Roscosmos may seem to exist without a great deal of fanfare about the link-up between the two (are we in that post-political age?) but the deal is a far-reaching one, with ESA involvement in the proposed Luna25 manned Moon mission, the Russian connection could pay huge dividends to the European space program which it wouldn’t be achieving alone (and of course the same could be said for the Russians). The 2016 mission is of course going to address the mystery Martian methane, and The Trace Gas Orbiter will also serve as a data relay asset for the 2018 rover mission of the ExoMars programme and until the end of 2022. When the US ‘won’ the space race to the Moon, the events of that time effectively ended the political interest in space for a generation. Even though America never claimed the Moon as ‘American’, the Stars and Stripes were planted there, and no other nation has sent humans to step foot on the Moon. Maybe enough time has passed for the Apollo missions to simply seem to far away to mean the same thing, that sense of the Moon having been ‘done’ has evaporated; indeed, more and more people around the world, and even in America, question that NASA successfully landed on the Moon. Let’s leave aside what an insult it is to great pioneers such as Buzz Aldrin, and focus on what’s next – a Russian mission to the Moon. With NASA’s recent statements about not ‘claiming’ places that they visit (with particular relevance to Mars), what about other nations? What if China goes to the Moon and claims it as Chinese? What if China gets to Mars first, will it reignite an international space-race again? It’s very unlikely, NASA has ruled out going back to the Moon, despite so much interest from others in going there, and indeed, players other than China and Russia can be counted in that number. In 2010, President Obama announced the administration’s decision to cancel NASA’s plans to return to the moon in favor of the new and ambitious Asteroid Redirect Mission. A robotic mission will grab an asteroid in outer space, lug it over to the moon and place it into lunar orbit. Once it’s in orbit around the moon, NASA will send astronauts to explore it, but they will not get involved in a race ‘back’ to the Moon. So what’s this new mission about? Well, it should have Europeans excited too. It’s now just a few weeks until the first UK astronaut to go to the ISS sets off on their historic journey. Now you can get involved and follow all the progress the website dedicated to this mission here http://www.principia.org.uk. The mission is called Principia to celebrate Isaac Newton’s ground-breaking text on physics,Philosophiæ Naturalis Principia Mathematica (“Mathematical Principles of Natural Philosophy”), which described the principal laws of motion and gravity on which all space travel depends. Tim will fly to the ISS as a member of the Expedition 46/47 crew. He will be launched on a Soyuz from Russia’s Baikonur cosmodrome in Kazakhstan on 15 December 2015 alongside NASA astronaut Tim Kopra and Russian cosmonaut Yuri Malenchenko. They will join the international crew already on the ISS, briefly bringing the number to nine, and then reverting to the more usual complement of six, before returning in May 2016. Some of the kit preceding Tim’s arrival was destroyed in Space X’s Falcon 9 rocket disaster, and so the back-up kit had to be sent on the Soyuz flight earlier this month. Tim will be conducting experiments on board the ISS, creating a series of films to be used in classrooms around the UK to teach students fundamentals of physics and chemistry, in addition to showcasing aspects of the UK space industry, currently employing over 30,000 people and worth over £11 billion per year to the UK economy. The mission could engage thousands of students in the UK, and inspire them to view careers in science as dynamic and exciting; something the UK badly needs with shortages of graduates in STEM subjects, reported to reach a shortfall of 100,000 in coming years. Airbus Defence & Space in France has been selected as the prime industrial contractor for ESA’s Juice mission to Jupiter and its icy moons. The agency’s Industrial Policy Committee approved the award of the €350.8 million contract on July 16, 2015. Pending the negotiation of contractual details, this should allow work to start by the end of this month. The formal contract signing will take place after the summer break. The spacecraft will be assembled in Toulouse, France, and many other ESA Member States will also be involved in Europe’s first mission to the largest planet in the Solar System. 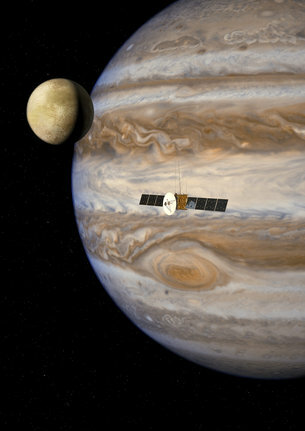 Juice (JUpiter ICy moons Explorer) was selected in May 2012 as the first Large-class mission within ESA’s Cosmic Vision 2015–25 programme. The spacecraft should be launched in 2022 and arrive in the Jovian system in 2030. Gravity assists with Callisto and Ganymede will be used to modify the spacecraft’s trajectory, and two targeted Europa flybys will focus on the composition of non-water-ice material on its frozen surface, and the first subsurface sounding of an icy moon. Callisto gravity assists will be also used to raise the orbital inclination to almost 30°, providing opportunities to observe Jupiter’s polar regions. The frequent Callisto flybys will enable unique remote observations of the moon and its neighbourhood. British Astronaut Tim Peake, the first British Astronaut to lice and work on the International Space Station, phoned into the Space Conference UK 2015. Tim had to make the call during his quarantine while he is on standby for the mission prior to his in case he would need to fill-in at the last moment for one of his colleagues. Tim’s mission is scheduled for the end of November. Tim has done incredible work with outreach programs for young people, which have included a broad range; from a competition to design the mission patch for him, to the Great British Space Dinner Challenge to plan a meal for him to eat in space with the winners working with Heston Blumenthal to develop the meal. During Tuesday’s call, Tim announced the winning schools for the competition to design experiments for him to carry out using the Raspberry Pi computer that he will have onboard the ISS. The winning schools were from Lincolnshire, North Yorkshire, Norfolk and London. In addition to these announcements, Tim talked further about his aspirations for his mission, and contribution to developing the space sector in the UK. Tim will be flying to the ISS on the Russian Soyuz spacecraft, the most reliable method to date. The Soyuz craft were developed in the 60’s under the Soviet space program, and it’s a fascinating testament to their creators that they have this record and are still the best way to get to ISS, but also a sign of the failure of any other systems to be developed, and just how difficult getting into space actually is.